Four months in Panama . . . and we’ve just begun to scratch the surface of what this incredible country has to offer, particularly for nature lovers such as ourselves. With a total population of just under four million, Panama is one of the most ecologically diverse countries in the Western Hemisphere, with many areas that are still relatively wild and unspoiled. 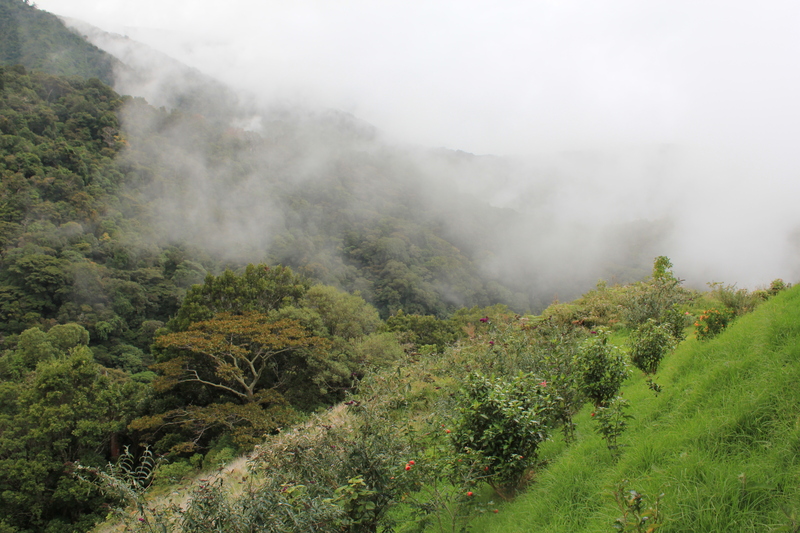 One such place is the Mount Totumas Cloud Forest, a bit of heaven at 6,200 feet on the edge of La Amistad National Park in northern Chiriqui Province. The 400-acre resort was created by two brothers, Jeffrey and Michael Dietrich, who share a commitment to preserving and protecting this highly unique area as a buffer zone for the wilderness in the national park. This dedication shows in virtually every detail of the property, from the micro hydro power station that provides the resort’s renewable energy, to the buildings that were hand-crafted from sustainable timber milled right on the property. A couple of weekends ago, we visited the Cloud Forest with our Boquete hiking group, led by Jere McCormick. It’s about a three-hour drive from Boquete, north to Volcan and through mile after mile of spectacular scenery. Here’s the photo record of our unforgettable visit! Putting our best hiking foot forward! Indiana Jones has nothing on these hikers! The Cabin, where we stayed. Looks Iike a beautiful hike. Can’t wait to be able to do the same. How long of a hike was it each day? Hi, Eric. The first day’s hike was longer than anyone expected – about 2.5 hours and pretty rugged. The next day the group broke into two – people that wanted a longer and more challenging hike and people that wanted to do the nature walk. We did the long hike, which took about an hour and a half, and then we did the nature walk. A great hike. Love those orchids. How fabulous! What a dream life you are living! So happy for you and John. Great photos…..but where is the pencil? What a beautiful place! I’ll have to send you an email soon so you can recommend some must-sees like this one when we’re down for 3 weeks :). Those wild orchids are stunning… but I was particularly fascinated by the 700 year old tree – how beautifully undisturbed. We can give you lots of tips! You’re going to have a great visit. See you soon! Gorgeous! My how time flies. Five months already. Isn’t it great having an opportunity to explore your new surroundings? It is, Deb! Every day is a new adventure. Beautiful pictures of a successful trek though this cloud forrest. It looks like life in Panama is agreeing with you. It’s pretty awesome here! Thanks! i love this posting and the picture of the 700 hundred year old tree! How blessed the tree: to see and witness the magic of it’s surroundings for seven hundred years! great pictures and reporting as usual. how lucky we all are to share in your journey! muchas gracias juan and susana! De nada, Bud! That tree was truly awe-inspiring. So looking forward to seeing you soon! Thanks for sharing your wonderful adventures in your new land…..love them! Majestic! Such beauty, Wish I’d spent more than a month in Panama! Next time around.